While trying to figure out what recipe to make for the next episode of Pan Asian, a look at my blog statistics told me that many people were checking out an older post for the above dish, Fish Ambul Thiyal. Like coconut sambol, paripu, and cashew curry, Ambul Thiyal is one of those defining dished of Sri Lankan cuisine–because no other cultures have it. Perhaps it’s because one of the dish’s main ingredients, goraka or gamboge, is not found in too many other places besides Sri Lanka. 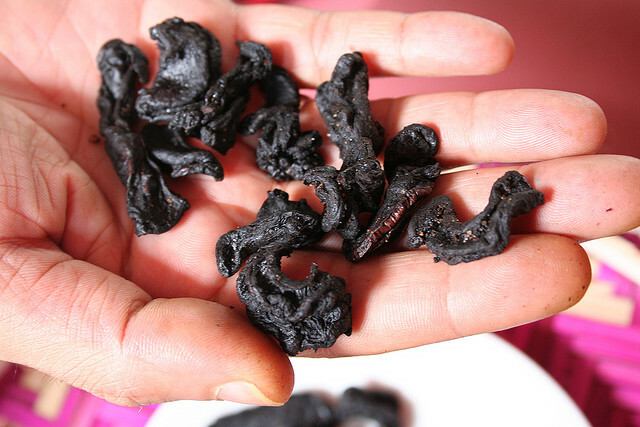 This orange fruit, which resembles a tiny, shriveled black kidney when dried, imparts a unique tartness, which balances out with the salty and spicy flavors of the dish, creating a truly amazing flavor. 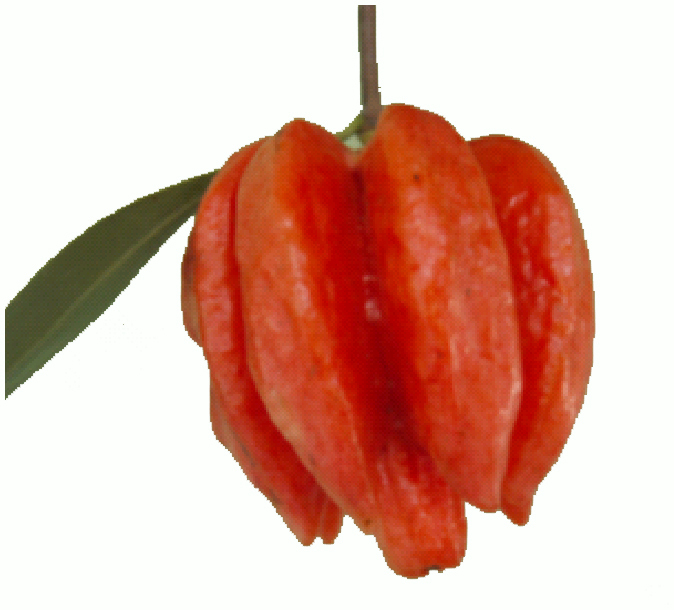 I’m also told its an excellent preservative, and in the days before refrigeration, using goraka in cooking allowed a dish to be stored and eaten later. Today, however, I cannot imagine there being any left-overs when you cook this dish because it is just that good–and simple to make. 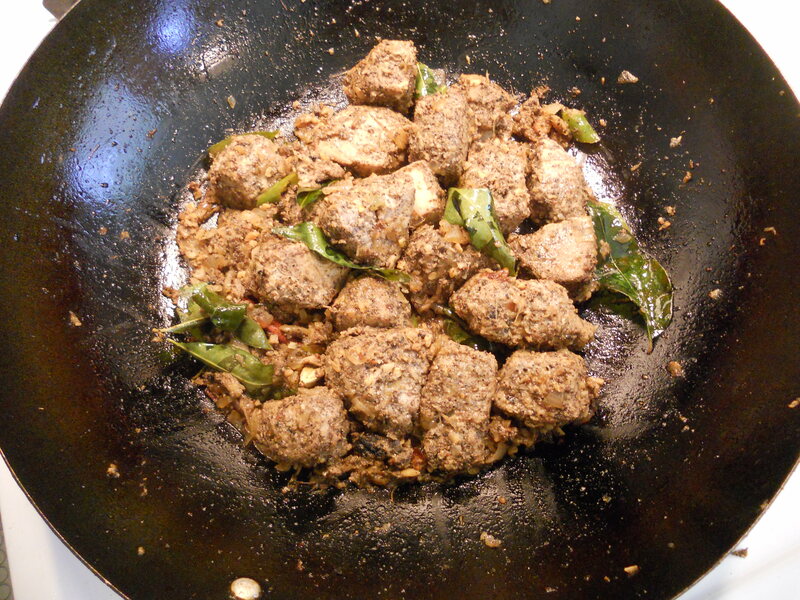 I have never tried making fish ambul thiyal with tamarind because I always have a steady supply of goraka on hand, and luckily a Sri Lankan store nearby (Spice Lanka, 17517 Redland Road Rockville, MD 20855-1233 – (301) 216-2238). 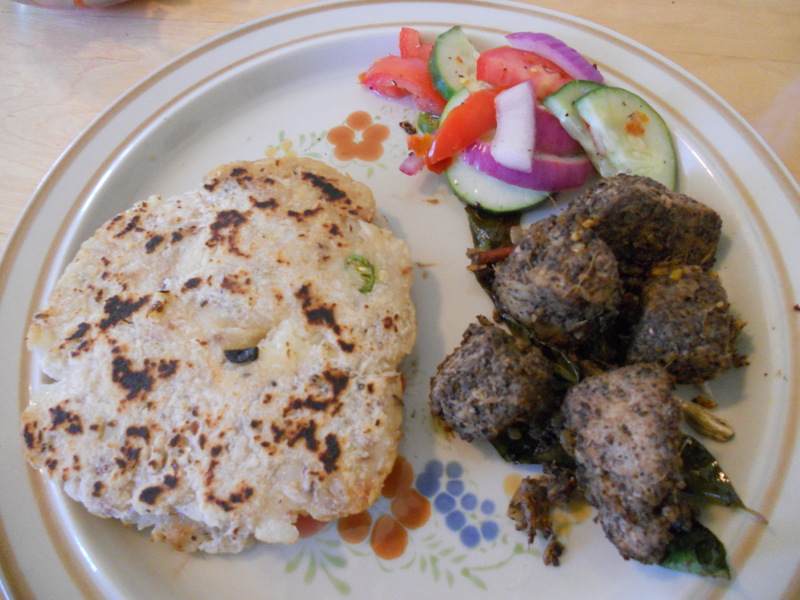 But if you do use tamarind in this recipe, please drop me a line and let me know how it worked out. I’m sure it will still be great, but it’s still worth the time to track down some real goraka. 1.) Wash fish and cut into 1” cubes. 2.) Roast (A) list ingredients in a pan until dark in color. DO NOT BURN. 3.) Place garlic, ginger, roasted ingredients, black pepper, fenugreek, goraka, and salt into food processor and grind to a thick paste. Add a little water if necessary and marinate fish in this mixture. (Note: If using tamarind instead of goraka, soak tamarind in 1/4 cup (65 ml) warm water. Strain and discard seeds and fiber. Add this to the mix). 4.) Heat oil in a pan. Sauté onions, clove, cardamom, cinnamon and curry leaves until onions are translucent. I enjoyed your site and this post very much. I stumbled and dugg it. Thanks, Chen! I’m going to check out your blog as well. Can you really cook that such food. thanks for this bit of information. This is a fantastic dish.. I have made it out of your book, but I appreciate the detail in the video. The goraka is a very exotic taste for the American palate… but it is admittedly very good once you wrap your head around it. I tried to pass it off on some gringo friends, who didn’t like it. Thanks, lovely recipe. I did a small change and added more pepper to this to be more palatable to the Sri Lankans. Since i was pressed for time i added already roasted curry powder and chilli powder to this instead of roasting again. It was really very good. If you do have it, i cooked this in a clay pot over a banana leaf. This added more flavour. I use more chili myself as well as a clay pot I picked up at the Chinese store.